Sathiguru Amar Das Jee Maharaj, the embodiment of humility in the house of Guru Nanak speaks to us today in Soohi Raag, the raag coloured in divine love. Guru Amar Das Jee is talking to us today of the relationship the jeev aatma - the soul bride, and the husband Lord - the Kant, Waheguru Akal Purakh Parmeshar. We are all soul brides. Whether we are males or females, it doesn't matter, our souls are all brides. We are waiting for our Kant, our Lord, our Master, our Waheguru. but only those brides who please their Master are accepted. Sathiguru Jee Maharaj is talking to us, telling us of that divine relationship of love between our soul and Akal Purakh. Our soul is a drop of that divine ocean, and truly within each human being there is a thirst of that soul. That soul drop, that thirst of love for God is within each human being. It is that thirst which human beings are trying to fulfil with cars and money and all these other things. However, the soul bride doesn't realise that without the union with God, without the union with Akal Purakh, all these other things will never be able to satiate that thirst inside. This is not the way to meet the Lord O my beloved ones. The Sikhs asked what is the way then? First you must haar, you must lose all of your cleverness, and all of your ego and everything. You must lose your affiliation to jathebandi, to organisation, even to this body. You must lose everything before The Lord. Haar pariou, you must say I have lost everything. There should be no thought that I am this, I am that. You must lose everything. 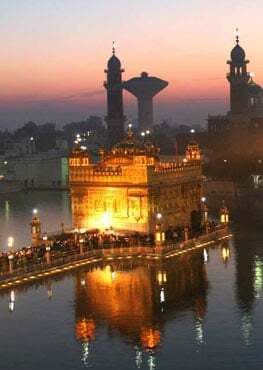 Haar pariou suaamee kai dhuaarai, at the gate of your Lord, at the gate of Waheguru, we must haar, we must accept that we have lost. In this world we can only lose without God, we must accept that first and we must lose everything within us first. Only then can we ask for dheejai bbudhh bibaekaa. Then we must beg for budhh bibaekaa, for spiritual wisdom. I am going to my Lord, but haar. I have realised that I've lost everything. I'm not going to my Lord in ego, I'm going after losing my ego. First you must accept death. What does that mean? You must accept the death of your ego, you must accept the death of who you are, you must accept the death of everything you believe is you. Then you go in front of The Lord. Guru Jee says decorate yourself with the outer, external decorations but first you must accept your death. Look at the Panj Piaarey. First they accepted their death from The Guru, they gave their head and then they put on the beautiful kakaars, the decorations of The Guru, then they were blessed with the Bana, with the name The Five Beloved Ones. First make yourself ready. Many Gursikhs have said that before you begin your saadhnaa, simran and meditation we must have it in our minds that God is watching us, God is within us, God is all around us. We must have that faith, that love there, and then on that love we can build. O bride, math - let it not be like this, that saejai ka(n)th n aavee. That to your bedside, your saejai, ka(n)th n aavee - your Husband Lord doesn't come. Eaevai birathhaa jaae - all these things, all these decorations will be wasted. Don't make it like this, that all your decorations should be wasted. What does this mean? These worldly decorations will be wasted. When we decorate ourself in God's love, in God's faith, in intoxication for Akal Purakh, then they will not birathhaa jaae, go wasted. If we first have that surrender in our mind, if we first have that idea that we're losing our ego. O kaaman, O soul bride, Guru Ji says if pir, if your Husband Lord's mind is graced upon you; tho baniaa seegaar, then your decorations, your seegaar will look beautiful. If you have pleased your Lord, then all your decorations will look beautiful. Whatever you do at that point will be paravaan, will be accepted, will be blessed; but only if, jaa sahu dhharae piaar. If your sahu, if your Husband loves you in His heart. If you do those things which invoke His love, then everything you do will be accepted. What is the decoration you must adorn yourself with now? Guru Ji tells us the decoration. Bho - fear, this loving fear of God. That person you love the most, you fear as well because you don't want to upset them, you don't want to do anything to hurt that person. The same thing with God. When we have that bho, that cleansing fear within us, that should be our decoration. Thabol ras. Ras means the essence, the love. Guru Ji says make love the betel nut leaves to eat and chew. Chew on God's love and essence. Have that within you. In your mouth, have that love. Bhojan bhaao karaee. Make bhaao, complete and utter devotion to Akal Purakh your bhojan. The wisdom, the love of God, make that your food. What does that mean? Live upon God's love. Than man soupae ka(n)th ko, Only if you give your mind and body, like the Panj Piaarey did, when you say to The Guru, everything is yours, my mind, body and soul is yours, not only in words but in deed like The Panj Piaarey did, ka(n)th ko - to our Husband Lord. Tho naanak bhog karaee - then you will be united completely, bhog means to be united. Kaajal fool tha(n)bol ras lae. Take kaajal, kaajal literally means the black eye enhancer which is put into the eyes to make them look sharper. Guru Ji says, within your eyes, put that kaajal of what? Of God's love. Fool - the flowers of God's love in your heart. Tha(n)bol ras, this ras, this essence in your heart. Lae - have these. Dhhan keeaa seegaar. Dhhan means wife soul, the wife soul has decorated herself. But if the Ka(n)th, the Husband Lord does not come, n aaeiou to her bedside, to her saejai, eaevai bhaeiaa vikaar - then all these things are useless. So Guru Ji says, you must have the thought of surrendering first before you begin to accumulate all these things like God's love and everything else. Sometimes, we are so eager to get that wisdom and knowledge of the path that we forget that we need to surrender first. Guru Ji says, they are not husband and wife who merely sit together. Dhhan means wife, pir means husband. Guru Ji is talking about the soul and The Husband Lord, and He is also talking of the relationship of a husband and wife in this world. On a higher level, Guru Ji is talking about the soul and God. Guru Ji is saying that merely by sitting in The Guru's Darbar, and not listening to what The Guru is saying we will not become one with God. That is the ultimate relationship, where there is one joth - one light, dhue moorathee - two external bodies. Those who have one light in two bodies, they are truly husband and wife. So on a worldly level, only if we have that relationship with our spouse can we be husband and wife. One light pervading the two bodies. But on a higher level, there cannot be any difference between us and our beloved Lord God. Only at that point there is true union. In the pouree, Guru Ji explains all these things that have come before. Guru Ji says without bhai, without fear of God, there cannot be bhagathee within us. Naam n lagai piaar. Our piaar, our love cannot be lagai, cannot be attached into The Naam, into God's Name. Why? Because if we do not even fear God, if we do not even have that discipline, if we do not even have that idea of listening to Akal Purakh in our ears, in our mind, then we cannot do bhagathee, we cannot worship or adore Him. Those people who we love, we must have some fear of them in our heart. Guru Ji says how do you gain this then? Sathigur miliai, when you meet The True Guru, bho oopajai, The Guru will bless you with that purifying fear and that love of Akal Purakh. Bhai bhaae ra(n)g savaar. From bhai, from this relationship of loving fear, bhaae - complete love, will be born. Ra(n)g savaar, you will be coloured in the ra(n)g, the colour of God's Name and God's love. Than - your body, man - your mind will be rathaa, will be imbued completely with this ra(n)g, with this love. Houmai thrisanaa maar, this love will kill your houmai - your ego, and your thrisanaa - your greed. Guru Ji says your man - your mind, and your than - your body will become niramal, will become pure. Ath sohanaa - the most beautiful. Bhaettiaa kirasan muraar - when we become one with our beloved muraar, Muraar means the destroyer of demons. Kirasan means our beloved. Bho bhaao - fear and love, sabh - all, they all belong to Akal Purakh. So sach, He is sach, He is true. Varathai sa(n)saar, He is within all of this universe, wherever we look in every direction, in every place. So Guru Ji is saying to us today, decorate yourself, but first surrender. Only when we surrender will these decorations be pleasing to our Husband Lord. May Guru Ji bless us that we follow this hukam with Guru Ji's grace.